The anatomy of the hoof wall plays a large role in how the hoof softens. The hoof wall is composed of horn tubules that provide strength and density to the hoof wall, while at the same time allows the hoof wall to be porous. In normal environmental conditions, these tubules will remain tightly packed and the hoof will remain strong. In wet environmental conditions, the porous structure of the hoof acts like a sponge and will absorb moisture. This excess moisture weakens the connective tissue crosslinks that hold the tubules in place. These bonds will continue to weaken and stretch if the hoof is exposed to moisture for an extended period. This process causes the hoof to lose its structural integrity and shape. Under normal conditions, the sole of the hoof is concave. This concave structure helps protect the more sensitive parts of the hoof and acts like a shock absorber. When the hoof absorbs too much moisture, the hoof wall expands. The expansion then stretches and separates the white line area. When the weight of the horse is applied to the softened hoof, the hoof begins to pancake, causing the sole of the hoof to drop. Hoof pancaking will also cause the hoof wall to weaken, crack, and split. This creates the perfect environment for numerous hoof related issues to arise. Hoof cracks, splits, chips, and distortion can form due to the development of soft hooves. Hooves may become tender to hard and rocky surfaces. Foreign objects, rocks, and other material can penetrate and bruise the softened sole. If the hoof becomes too tender, the horse may have difficulty walking or become lame. A softened hoof increases the likelihood of abscessing. The weak hoof wall, stretched white line, and softened sole make it easier for bacteria and/or foreign material to penetrate the hoof capsule. 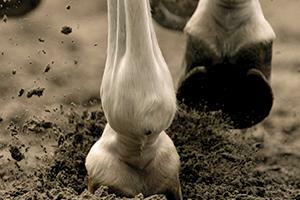 This can result in the formation of hoof abscesses. A soft hoof makes it challenging for a horse to hold a shoe. 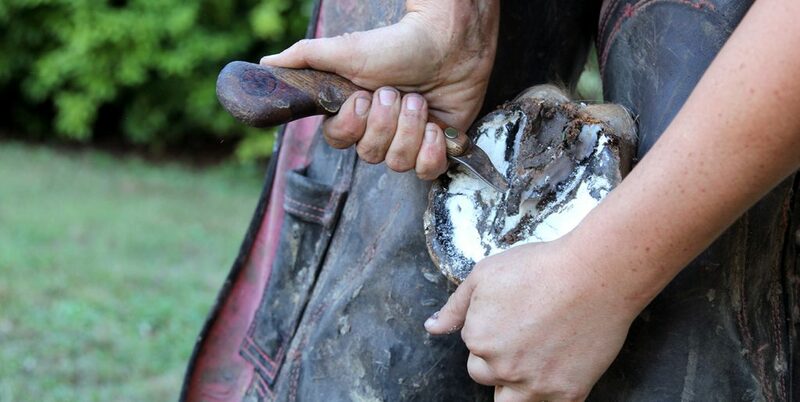 When the hoof becomes too soft, clenched nails holding the shoe will loosen, pull out, or tear away. This can result in chunks of the hoof wall tearing out; especially around the nail holes. The loss of hoof wall makes it more difficult to reset the shoe. 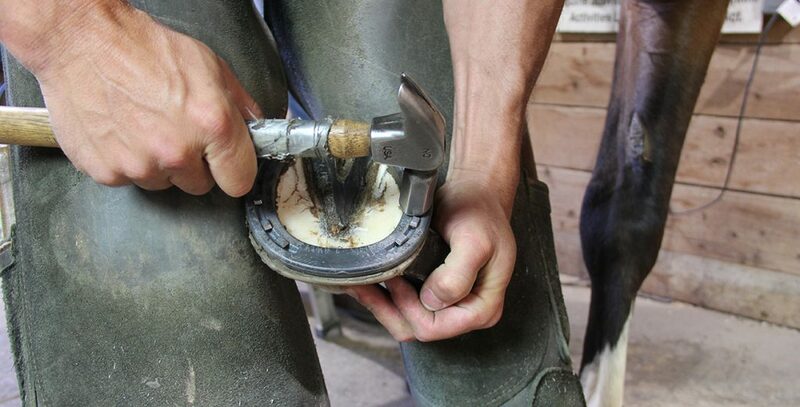 The farrier may resort to gluing the shoe if too much of the hoof is damaged. Wet and muddy conditions expose hooves to “hoof-eating” microbes that cause thrush and crumbling hoof horn. Crumbling hoof horn, cracks, chips and flat soles are entry points for microbes to invade and thrive. A soft hoof is susceptible to a wide range of hoof related problems. Your horse could become lame from one or more of the above problems. Proper hoof care, clean and dry environments, and proper nutrition all play a role in maintaining a healthy hoof. Avoid allowing your horse to spend extended periods of time in wet and muddy environments. Use shavings and provide your horse with a clean and dry environment. 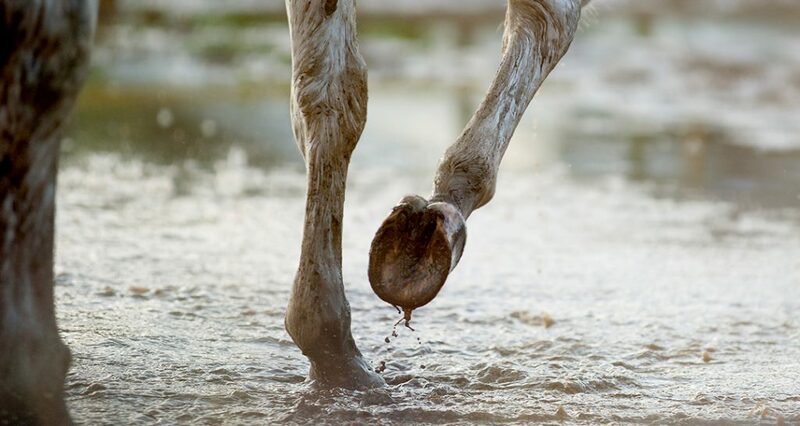 Routinely dry and clean your horse’s hooves of any mud, debris, or foreign material. Keep a regular farrier schedule. Provide proper nutrition and a quality hoof supplement such as Farrier’s Formula® Double Strength to develop a denser, healthier, and more resilient hoof. 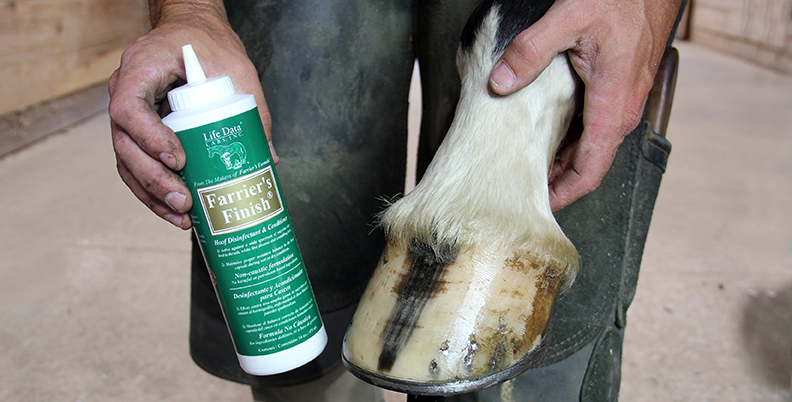 Regularly apply a non-caustic hoof conditioner such as Farrier’s Finish® to help regulate moisture balance. TIP: Adding 2-3 tablespoons of table salt or Epsom salt to a 16 oz bottle of Farrier’s Finish® will help pull out excess moisture and harden the hoof. If your horse develops soft hooves or other hoof related issues, consult with your farrier and veterinarian. If you have any questions on utilizing Life Data® products to help treat or prevent soft hooves, contact us at 1-800-624-1873 or by e-mail at cservice@lifedatalabs.com. Although thousands of years have passed since the the days of the wild horse, the genetic makeup of the horse has changed little. Therefore, the nutrient requirements for maintenance have not changed significantly. What has changed is the involvement of civilizations in altering the environment surrounding the horse. Below are a few examples of these changes. Through work and athletics, we are demanding more from many of our horses. The additional physical demands require the horse to burn calories along with other nutrients for fuel. Additional nutrients are required by the performance horse in hard work. Modern agricultural practices have resulted in certain minerals becoming deficient in many of the soils. Grasses and forage that grow in the soil will be deficient in these minerals. Fertilizers and chemical applications have also altered the nutrient composition of soils. The horse grazing our modern fields is predisposed to nutrient imbalances. Ancient horses roamed and grazed a wide variety of forages to satisfy their nutritional requirements. Today we keep our domesticated horses confined to pastures and barns, limiting the diversity of the forages and thereby increasing the likelihood of nutrient deficiencies or excesses. The resulting dietary nutrient imbalances have likely contributed to the hoof, skin and metabolic problems that are common in horses today. Farrier’s Formula® is formulated to fulfill the deficiencies and correct the nutrient excesses for optimal connective tissue health in horses across the globe. Through research and laboratory tests, Frank Gravlee, DVM, MS, CNS determined daily nutritional requirements for horses. When developing Farrier’s Formula®, Dr. Gravlee used this research to develop a “complete hoof supplement” that covered the deficiencies or excesses that can create hoof problems. Dr. Gravlee also determined the proper ratios and proportions of these nutrients so they work together and do not interfere with one another. A horse must use energy and resources to process nutrients. If the horse has an excess of one nutrient, it must utilize other nutrients to provide the energy required to process the excess. This may cause an imbalance in nutrients. Farrier’s Formula® is properly balanced to eliminate the risk of over supplementation. Life Data® is committed to continued research to better understand the relationship of nutrients and the health of the horse. We continue using this research to develop products that will improve the well being and health of horses around the world. Farrier’s Formula® ushered in the concept of “Feeding the Hoof” in the early 80’s and is the gold standard of hoof supplements. The research behind Farrier’s Formula®, the quality ingredients and the nitrogen packaging to preserve the nutrients separate it from other hoof supplements. 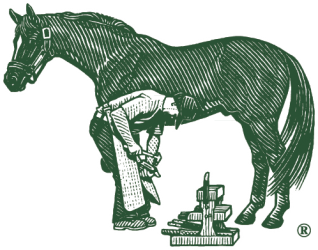 What establishes Farrier’s Formula® as the “gold standard” is one simple concept, Farrier’s Formula® works. 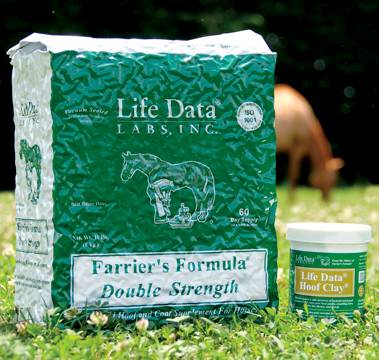 Life Data® has continued developing a range of products that work with Farrier’s Formula® to not only improve the quality of hooves but also improve the overall health of the horse. 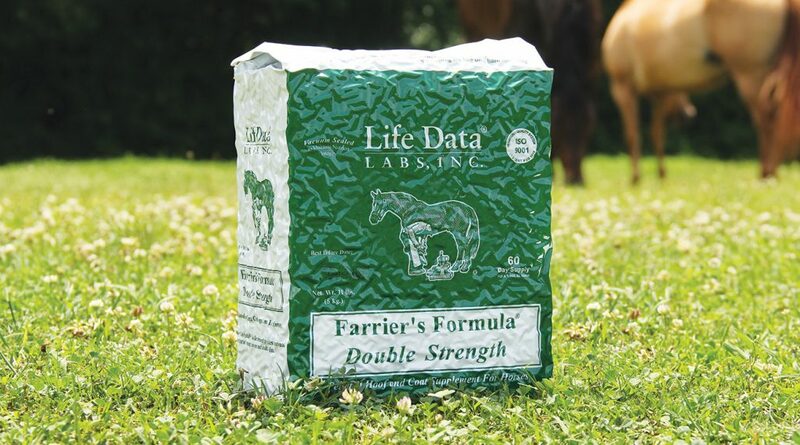 Farrier’s Formula® can be used as a stand-alone supplement or used in conjunction with other Life Data® products. Farrier’s Formula® can be fed with Barn Bag® Pleasure and Performance Horse Pasture and Hay Balancer. Both products are balanced nutritionally, will not interfere with one another, and will not lead to over supplementation. For building the optimal hoof, feed Farrier’s Formula® with regular applications of Farrier’s Finish® and Life Data® Hoof Clay®. This will provide the nutrients required to build a healthy hoof internally, while protecting new growth from the external environment. Farrier’s Formula® continues to work because it was designed with the horse’s nutritional needs in mind. If you have any questions on Farrier’s Formula® or any of our other products, feel free to contact us at 1-800-624-1873 or visit our website. Properly balanced nutrition and quality hoof supplements strengthen and increase the density of the hoof wall, reducing the likelihood or severity of White Line Disease. Burney Chapman, a world-renowned farrier from Lubbock, Texas, became one of the foremost authorities on White Line Disease back in the late eighties and early nineties. At that time, he began to see an alarming increase in the numbers of white line cases he encountered in his shoeing practice both in the U.S. and U.K. Burney determined that it was not a disease of the white line, but rather the result of a fungal invasion of the middle hoof wall. Burney named the condition “Onychomycosis”, or ONC. The disease is also known as Stall Rot, Seedy Toe, Hollow Foot and Wall Thrush. At first blush almost everyone, including Burney, thought White Line Disease was found in environments that were poorly maintained. However, the more he encountered it, he began to realize the disease occurred more often in clean, well-managed stables and barns. He also observed that there was no correlation to breed, color, or front versus back feet; and that the initial stages were non-painful and usually detected by the farrier during routine hoof care. Today, we know a bit more about White Line Disease and recognize that all horses are exposed. The medial (middle) hoof wall is the structure affected. The damage is caused by organisms commonly found in the environment, both bacterial and fungal. These organisms require a nutrient-rich environment that is lacking oxygen to flourish. The outer hoof wall is more resistant to invasion due to its higher density and exposure to environmental oxygen compared to the low density and lack of oxygen in the middle hoof wall. The third section of hoof wall, the inner hoof wall, is more resistant to invasion due to the proximity of live tissue in this area. The live tissue is not only oxygen rich, thereby inhibiting these opportunist anaerobic organisms, but also has infection fighting abilities. Due to this, many horse owners approach White Line Disease as an external battle, but White Line Disease prevention begins with internally healthy hooves. For example, picture a castle protected by a strong exterior wall. If the people inside are healthy and thriving, the outside wall can be maintained and kept strong from outside invaders. If the castle is unable to maintain the wall, over time the outside wall will begin to deteriorate, weaken, and crumble; making it easier for outside invaders to penetrate. We can take this same example and apply it to our horse’s hooves. If we are not properly providing for the hoof internally, the outside integrity of the hoof will reflect the same. As the external protection begins to deteriorate, the hoof becomes less resilient to infections such as White Line Disease. Maintaining a healthy hoof internally begins with proper nutrition. Proper nutrition and hoof quality are directly correlated. In fact, poor hoof quality is one of the first signs of poor nutrition. Developing a balanced diet and feeding a quality hoof supplement can provide the nutrients needed to support stronger and healthier hooves. It may also help promote regrowth and recovery for hooves suffering or damaged from white line disease. Feeding your horse an unbalanced diet can have the reverse effect. For example, as mentioned in previous articles, excessive selenium supplementation and excessive bran in the horse’s diet are nutritional factors that can increase the risk of White Line Disease or other hoof related issues. Although proper nutrition alone may not resolve White Line Disease, it is a vital step in building more resilient, stronger and healthier hooves. Protecting hooves externally utilizing a non-caustic topical product while also providing a quality hoof supplement is the most effective way to prevent and treat White Line Disease. Consult with your veterinarian and farrier if your horse is suffering from White Line Disease. If you have any questions, feel free to visit our website or contact us at 1-800-624-1873 or cservice@lifedatalabs.com. 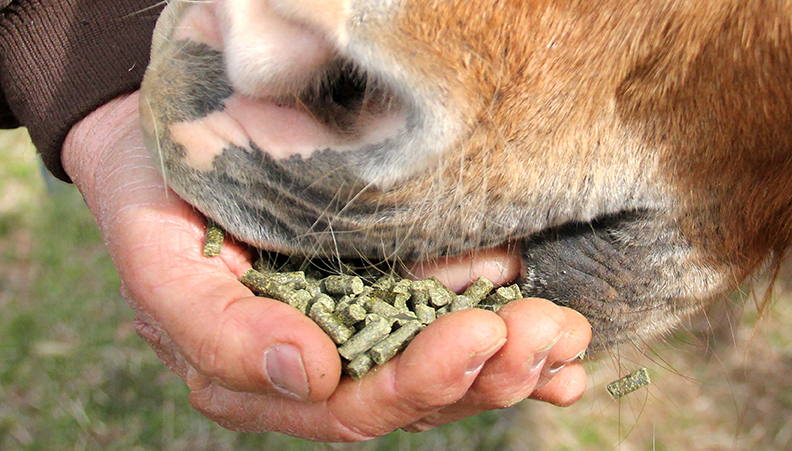 Learn More About Feeding for Hoof Health. Whether it is an animal, plant or other living organism, all living things must have a genetic code and chemical process to maintain life. All living organisms have nutrient requirements that are basically the same at the metabolic level. The difference is how these requirements are absorbed to provide nutrients and energy to live. For example, plants can manufacture the nutrients and energy they need by staying in one place. They can do this by using the energy from sunlight, along with water, oxygen and nutrients from the soil. In essence, they are self-sufficient. Unlike animal life, plants do not depend on other living things to survive except for the soil microbiome at their roots. Although horses belong to the same animal class as humans and other mammals, they are metabolically smarter than most other mammals. 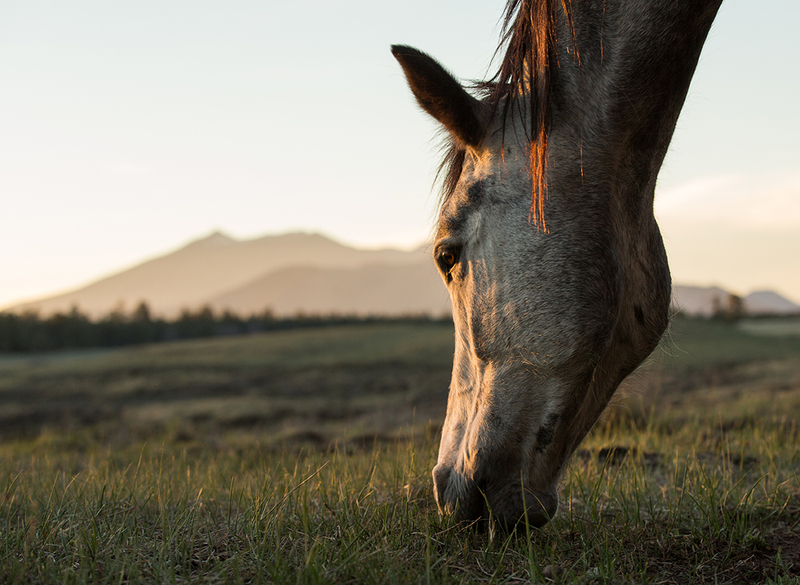 The nutrient requirements between horses and other mammals are the same at the metabolic level; however the horse’s ability to manufacture nutrients is far more advanced. Humans, for example, must obtain most nutrients they need directly from what they consume. The food and nutrients are delivered to the digestive tract, broken down, and provided to the rest of the body. A horse’s digestion process is much more complex than this. This is in large part due to the hindgut (including cecum and large intestine) of the horse. The cecum is a large organ within the digestive tract that houses microorganisms. These microorganisms break down the fiber and cellulose the horse consumes and converts the cellulose into additional nutrients and energy that the horse needs to survive. So unlike humans and other monogastric mammals which eat and drink to consume nutrients that are ultimately absorbed, horses not only eat and drink to absorb nutrients but also to feed the microorganism factory within their cecum. To simplify this process, we can think of the cecum as a “garden” for the horse. This garden enables horses to be mobile in order to consume the nutrients they need. Horses fertilize the garden with the energy and nutrients needed to thrive by providing it with the cellulose of the plants consumed. The garden then produces the “fruits”, or additional nutrients, the horse requires. Before the domestication of horses they were naturally roamers. They would roam, graze, and find the proper nutrition they needed to fully provide for the hindgut microorganisms. Today, we have restricted the horse’s ability to do this by enclosing them in pastures, paddocks, and barns. We have also increased their natural calorie needs by demanding more of them through riding, training, athletics, and work. Modern feeding practices have altered the natural diet of the horse. Many complete feeds contain excess fats and sugars (molasses), and are also fortified with additional nutrients. This “all-in-one” concept tethers calories and nutrients together; therefore hard keepers and working horses must consume large amounts of the fortified feed to maintain body weight. This often results in over-supplementation of nutrients, and a diet too rich in fats and carbohydrates. On the other hand, easy keepers are often under-supplemented using this method of feeding. Also note that horses do not have gallbladders. Without a gallbladder the horse is unable to break down and digest the excess fat in many of the modern complete feeds, leading to diarrhea, gas and digestive upset. Chewing is instrumental to the horse’s digestion because the grinding serves two purposes, to grind the feed down to small particles and to generate salivation. In a horse, salivation is not initiated from smell or taste, but by the physical action of grinding the teeth. For proper digestion and utilization by the hindgut microbes the feedstuffs must be properly chewed and ground down into fine particles. For the horse to achieve suitable grinding dental health must be maintained with proper floating. “Over floating” the teeth will inhibit the horse’s ability to grind. The teeth must have rough opposing surfaces for the horse to be capable of proper grinding – if the teeth are too smooth it would be like trying to grind feedstuffs between two pieces of glass. The horse’s salivation is also important because it coats and moisturizes the food particles in digestive enzymes to kick start the digestive process and help deliver the particles to the GI tract. Most compound and textured feeds that we are using to replace the natural diet of the horse are “pre-chewed”, meaning that the feed has been ground already. The reduced chewing time restricts the amount of salivation, thus interfering with and bypassing an important part of the horse’s digestion. If you do not properly care and provide for your garden at home it will not produce healthy fruit, but only weeds and grass. The same goes for your horse. If you do not feed your horse naturally, the garden within your horse will not provide the proper nutrition your horse needs. This can create health issues for your horse. But, like your garden at home, these weeds can be picked. It is never too late to provide your horse with a natural diet. Remove the fatty foods, the complete feeds, and provide your horse with the diet nature intended it to have. Natural grazing and feeding hay will provide the horse with most of the calories and nutrients the horse needs. Any additional calories needed to maintain body condition should be separated from any additional nutrient intake. If additional calories are needed, oats, beet pulp, or copra can be fed to meet these increased demands. Proper supplementation with a hay and pasture balancer is also important to replace the nutrients the horse may not be finding in the modern restrained lifestyle. If you have any questions regarding your horse’s diet contact your veterinarian or feel free to contact us at 1-800-624-1873.